​There are dozens of excellent watch brands to choose from, including household names like Rolex and Omega through to renowned specialists such as Patek Phillippe. The choice can feel a little overwhelming. We've chosen 10 of the best watch brands which you've probably heard of to give an idea of what you can expect to spend and what you will get for your money. Here's a disclaimer for the watch nerds though - I'm aware there are many excellent brands which I've excluded. I've included a mix of brands I like and a range of prices from £100 to £100,000 with a few second hand prices as well (since we don't all have £100,000 to spend on a watch). Japanese watchmaker Seiko started up in the late 19th century and is certainly at the budget end of the quality watch market. However, you will find some luxury-style features on some of their timepieces. For example, they sell some of the cheapest ‘automatic’ watches on the market - which means that it is powered by your wrist moving rather than by batteries and 'quartz'. Prices start from as little as £100. Towards the upper end of their range (£200 - £400), you’ll find watches with ‘sapphire’ crystal and transparent coating. For those baffled by the jargon, that essentially means that the transparent front of the watch will be stronger and more scratch resistant than cheap watches, and it will be easier to see in bright sunshine. I imagine that some jewellers and watch snobs would not consider Citizen to be a luxury watch brand. However, they are worth considering if you want a well-built watch which keeps spectacularly accurate time and doesn’t require batteries. They are made in Japan, which has a reputation for quality watchmaking but my opinion is that Citizen is more about clever gadgetry and innovation than about traditional ways of making luxury watches. The company has been going for about 100 years, so they have some pedigree, though not as much as some Swiss firms (Omega, Rolex, Tag Heuer etc). For example, most of their watches use Eco-Drive, which means that they are powered through solar power on the watch front. So, they don’t need their batteries changing but they are still ‘quartz’ watches rather than the more traditional (and more expensive) ‘mechanical’ watches which use a tiny spring to keep ticking. Higher end Citizen watches are also radio controlled and receive updates from the atomic clock to ensure they are accurate. If you like the prestige and history of Swiss watches but don't have a vast budget then I'd take a look at Tissot - one of the cheapest of the high quality Swiss watch brands. The cheaper end of their range (£100 - £350) are generally the less fancy quartz watches but they have some attractive swiss styling and some high quality features (such as a scratch resistant front). Many of the more expensive tissot watches (£350 - £750) are made with the more traditional method of having an automatic movement which is powered by your own wrist motions (ooh er missus). Tissot is now part of the Swatch company but is amongst the longest established of the Swiss watchmakers with roots going back to the mid 19th century. It built a reputation partly through innovations which included the first plastic watch and the (somewhat less imitated) wooden watch. They also often are official timekeepers for sports. Gucci is a bit of a controversial one to include in this top 10 best watch brand guide, since they are one of several world renowned fashion houses which also produce watches as opposed to the traditional Swiss watchmakers which wholly make timepieces. In my view, you are paying a fair amount for the name since clothing label watches tend to have fewer of the features which you would normally associate with luxury watches. For example, the vast majority of Gucci watches are quartz (battery powered) rather than automatic (powered by the motion of the user) and some are splash resistant rather than waterproof. So why have I included Gucci? Well, many people like Gucci watches because you get the company's reputation for Italian design and style alongside the Swiss reputation for quality watchmaking. They also represent a huge chunk of the luxury watch market, so it seems fair to include at least one fashion label timepiece. There are cheaper options, if you like the idea of a watch made by a label. Emporio Armani or Hugo Boss watches start at about £100. I've got a soft spot for Rado watches, which have plenty of character and are one of the more affordable Swiss watch brands. OK, so you could certainly get a cheaper quartz watch in the Argos sale but most of the Rado range is in the hundreds of pounds rather than in the thousands. They are owned by the Swatch group and have been going for about a century. Rado watches tend to be a bit funkier and unusual than some so they are a bit of a riskier gift than something like an Omega or Tag Heuer men's watch with a metal bracelet. Personally that's why I like Rado watches, since they have a pretty distinct design combined with the prestige of being made in Switzerland. The majority of Rado watches are quartz rather than automatic (they take a battery rather than relying on your own movement to keep going). You'll need to cough up a couple of thousand pounds for an automatic Rado watch. Whilst quartz won't appeal to some watch owners who prefer the tradition of an automatic mechanical watch, it does provide accurate time and Rado watches do have other luxury features such as a tough synthetic sapphire front (the 'crystal'). Rado also like to mix it up a bit with unusual metals in their watches such as tungsten rather than the usual stainless steel. Like most luxury watch brands, Tag Heuer is based in Switzerland and (much like Omega) has a history which goes back to the late 19th century (it was two companies for many years). The company has long associated itself with sport, with various sponsorship deals with sports stars, football and racing teams (including Formula One). Although prices for Tag Heuer watches start under £1000, you'll find that the lower priced watches are quartz watches rather than automatic. If that's jargon to you, it means that the mechanism which makes the watch move uses a battery rather than relying on the movement of the wearer to keep it going. Quartz is actually more accurate but most watch aficionados prefer mechanical watches which have a smooth sweeping motion on the second hand. You will find though that even the watches at the lower end of the Tag Heuer range have some luxury features, such as sapphire for its 'crystal' (the transparent front of the watch) and anti reflective coating so you can see it in the sun. More luxury features start to appear at around the £1500 price tag. Tag Heuer won the world's best watch prize - the Aiguille d'Or Grand Prix - in 2012 for its Mikrogirder and it has won several other awards at the Grand Prix d'Horlogerie de Genève in the last few years. You'd need to dig deep for an award winner but it does give you an idea of the brand's quality. By my reckoning, Omega is probably the second most famous watch brand in the world - with Rolex as the first. I'm sure others will disagree, but that's my view. Entry level prices aren't quite as eye-wateringly high as some watchmakers, but you'll still need a couple of thousand pounds to pick up a new Omega (or from about £300 second hand). As you are probably aware, Omega is another one of the world's best known luxury watch brands which is based in Switzerland (generally considered the centre of the industry). It was established in the late 19th century, several decades before Rolex. So are you just paying for a fancy name and a marketing budget or do you get quality for your money? I would say that even entry level Omega watches tick the boxes for what makes a high quality luxury watch. For example, the £3000 Omega Seamaster 300M is an automatic watch (meaning it's powered by your own movement rather than a battery), it has a tough synthetic sapphire crystal (the transparent front of the watch) and it is a certified chronometer (meaning it is sent away for testing for accuracy for several days). It also has things like a reflective coating and the bracelet is linked with tiny screws rather than cheaper and inferior pins which some watches have. If you've got a bigger budget, you'll be able to afford a watch which includes precious metals, such as 18 carat gold as part of the casing. Breitling watches are aimed at the diving and aviation market, although of course you don't have to do either of those to own one of their watches. 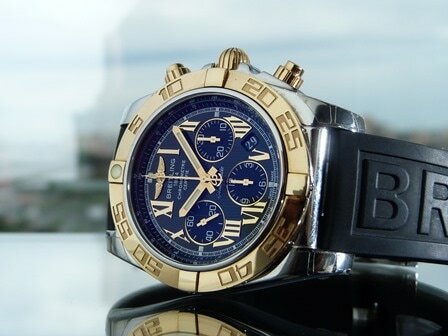 Like most of the best watchmakers, Breitling is Swiss and was founded in the second half of the nineteenth century. 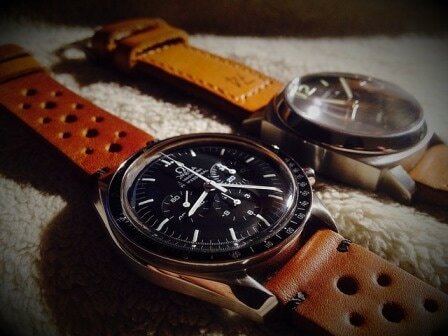 The company is famous for making chronograph watches (those with several dials) and its reputation was also helped by providing watches for astronauts and for an appearance in the Bond film Thunderball. I'd say that Rolex is probably the world's most famous watch brand, you'd certainly not score well on Pointless for naming it. You can spend tens of thousands of pounds, but prices for Rolex watches actually start at a much lower price than many other renowned brands (although you'll still need about £5000 for a new men's Rolex watch). As you are probably aware, Rolex is a Swiss company which has been going for just over a century. So, it's not actually as long established as some watchmakers but it has developed its reputation thanks to innovation (and intelligent marketing too I'm sure). For example, Rolex was the first watch to be waterproof to 100 metres, which showed an ability to make a watch with outstanding build-quality. Of course, you are paying a premium for the Rolex name (up until the 1990s, James Bond wore a Rolex) but you are also buying a watch which ticks many of the boxes of what makes a luxury watch. For example, many Rolex watches are certified chronometers, which means they have been sent off to Swiss organisation COSC, which tests the accuracy of the watch over several days in various temperatures. Higher priced Rolex watches include precious metals, whilst a 'cheaper' Rolex has a high grade steel bracelet. Modern Rolex watches also have a synthetic sapphire crystal, which means that their transparent front is unlikely to be damaged. Rolex is also one of the luxury watch brands which makes their own movements in-house. That doesn't necessarily make it better quality, but some see it as a badge of honour to have the parts made by the company with their name on the watch, rather than by a third party. The closest comparison I can think of is people who are a bit dismissive of cars which have engines from other vehicles. ​Rolex also make the Tudor brand of watch. ​Rolex watches are better at holding their value than some luxury items, so there is a strong second hand market. Be wary of buying a Rolex from a guy called Dave in a pub, it's probably a Faux-lex. Queen Victoria was amongst the former owners of a Patek Phillippe watch, which gives you some idea of the company's history and reputation. Patek Phillippe is arguably the most prestigious of all the Swiss watch manufacturers and their watches carry price tags to match. The most expensive ever watch sold was a Patek Phillippe ($24 million, in case you are interested) although you can pick up a second hand one for a few thousand. So what do you get for your money besides a fancy name? Well, as you'd expect they tick most of the boxes of a luxury watch with most models offering such as an automatic movement (so it doesn't require batteries) and in house manufacturing, rather than parts made by other companies. Many Patek Philippe watches are absurdly intricate too, with multiple 'complications' (extra dials and features which tell you things besides the time). There are a handful of similar watchmakers who specialise in ultra expensive timepieces, including Vacheron Constantin and A. Lange & Söhne.